What is Mako™ Robotic – Arm Assisted Surgery? Mako™ Robotic – Arm Assisted Surgery for partial and total knee replacement, and total hip replacement uses advanced surgeon-controlled robotic arm technology that enables a high level of accuracy. This patient-specific procedure is tailored to your anatomy, optimizing joint movement and accelerating your return to an active lifestyle. Benefits may include: unparalleled precision, smaller incisions, less painful recovery time, increased joint functionality and more. Uintah Basin Healthcare (UBH) is the first hospital in the region, and one in only five in the state, to offer Stryker’s robotic-arm assisted total knee application for use with its Mako System. This latest advancement in joint replacement surgery transforms the way total knee replacements are performed. Partial Knee Replacement is a treatment option for adults living with early-to mid-stage osteoarthritis (OA) that has not progressed to all three compartments of the knee. 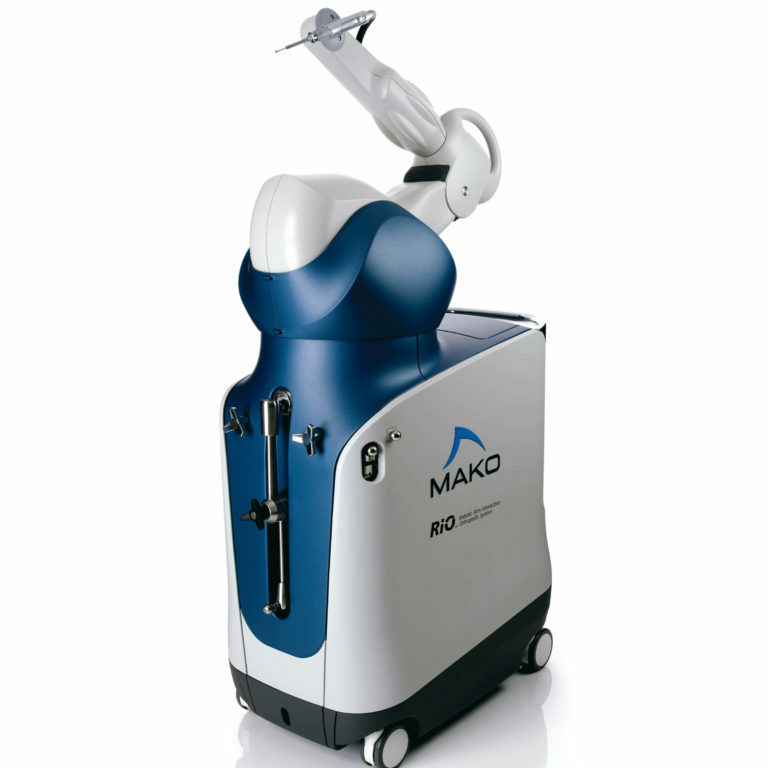 Mako™ Robotic – Arm Assisted Surgery Partial Knee Replacement is an advanced treatment option. It is powered by the RIO® Robotic Arm Interactive Orthopedic System, which allows the surgeon to perform surgery accurately through a smaller incision as compared to manual procedures. By selectively targeting the part of the knee damaged by OA, surgeons can resurface the knee while sparing the healthy bone and ligaments surrounding it. Mako™ Robotic – Arm Assisted Surgery Total Hip Replacement is a breakthrough solution for adults suffering from painful degenerative joint disease of the hip who need a total hip replacement. It is powered by the surgeon-controlled RIO® Robotic Arm System, which enables more accurate implant placement, which may reduce complications, such as implant wear and dislocation. CLICK HERE to learn more by visiting the Stryker/Mako website. Appointments available in Roosevelt & Vernal. Uintah Basin Healthcare is the only hospital in the Uintah Basin Region to offer Mako Robotic – Arm Assisted Surgery. MAKO Robotic-Arm Assisted Surgery offers an innovative approach to improve surgical outcomes for partial knee and total hip replacement procedures through greater surgical precision than traditional methods. However, individual results may vary. There are risks associated with any surgical procedure, including MAKO Robotic-Arm Assisted Surgery. Your doctor can explain these risks and help determine if MAKO Robotic-Arm Assisted Surgery is right for you.